The Zoning Board of Appeals held hearings on Thursday, February 26, for two complex property improvement cases involving off-street parking. Assigned to the hearings were board members Mark Zuroff, a lawyer serving as chair, Christopher Hussey, an architect, and Avi Liss, a lawyer. Alley conflict: A proposed 4-car garage behind 1471 Beacon St. had wound through two Planning Board hearings and a previous Appeals hearing. The apartment building suffered a major fire a few years ago and has now been largely rebuilt. Previously it had only informal parking on an alley in the back. The developer, who is selling units as condominiums, wanted to create deeded parking in a small garage, adjacent to the alley. He had originally proposed five spaces, but tight spacing and access led to criticism at Planning and Appeals, and he returned with a proposal for four spaces. Neighbors along Beacon St. seemed satisfied with the changes. Neighbors behind on Griggs Terrace–a private way–were definitely not happy, and they spoke in opposition. The legal alley access is from the narrow, sloping Intervale Crosscut, connecting Beacon St. with Griggs Rd. about a tenth of a mile toward the west. Neighbors claimed the alley will often be blocked, and vehicles will trespass on drives connecting to Griggs Terrace. Land adjacent to the row of apartments near 1471 Beacon forms a steep slope in back, descending around ten feet to about the elevation of Griggs Park. The terrain was created in late-nineteenth century as a part of historic Beacon St. apartment development. Dense vegetation, including large trees, has helped to control storm run-off and restrain the slope from erosion. The developer proposed to excavate a wedge-shaped segment of the steep slope and install a concrete garage structure with thick supporting and retaining walls and a buried drywell to manage storm water. On top, he proposed to create a landscaped terrace, to compensate for removing trees. The floor of the garage was to be level with the alley. The developer needed special permits for smaller setbacks than standard zoning and for design review of a structure along Beacon St. With four rather than five cars, the dimensions did not need a variance–usually much harder to justify. That such a complex and costly plan appeared practical indicates the high prices being paid for parking in urban areas of Brookline. Neighbors said they had been alienated by the developer’s conduct during about three years of construction. The alley is a composite of small parcels, with mutual rights-of-way deeded to and used by many of the owners of adjacent property. During construction, they said, equipment and materials had been stationed in the alley, trespassing on their property and that of others and interfering with access. Neighbors asked for an enforceable permit condition specifying that the alley would not be blocked again. After about an hour and a half of testimony and wrangling among board members, the Appeals panel voted to grant the permits needed for the garage, attaching several conditions, including provisions intended to help neighbors stop potential obstruction of the alley in the future. Neighborhood conservation: Renovation and expansion of a house at 66 Perry St. has involved a wide range of issues, including parking. This has been the first Brookline property improvement proposed in a neighborhood conservation district, and the Appeals board is not the last stop on the line. By the time the case is finished, reviews will probably total almost a year. After a six-year study, Brookline created its first neighborhood conservation district in the fall of 2011, for Hancock Village in south Brookline. So far, that has not generated any cases. In spring, 2014, another district was approved at town meeting, involving parts of Toxteth St., Perry St. and Aspinwall Ave. These districts are intended to extend property regulation beyond traditional zoning to help maintain neighborhood characteristics more complex than property uses and dimensions. Boston enacted an “architectural conservation district” in 1975. Cambridge created its first “neighborhood conservation district” in 1984 and now has five districts. Other Massachusetts communities with similar regulation include North Andover, Amesbury, Lexington, Lincoln and Wellesley. There is no Massachusetts enabling law for this type of regulation. Each community using it has created its own ordinances or bylaws, justified under the general “police power” of cities and towns. Brookline’s approach creates a separate bylaw for each district. Without an enabling law and an accumulation of case law, communities have to develop their own standards and procedures. One reason reviews of the proposed property improvements at 66 Perry St. have taken so long is that the boards involved have been working out the process–more or less on-the-fly. It looks likely to be a typical case in that both zoning and neighborhood conservation regulations apply. The Planning Board and Zoning Board of Appeals, established in the 1920s, review the zoning issues, while a new Neighborhood Conservation District Commission reviews issues for which it is named. There is considerable potential for overlap; that occurred with 66 Perry St. So far, the commission held two hearings, the Planning Board two and Zoning Board of Appeals one. First commission case: After the property owner had settled on a design, following commission review, the Planning Board urged changes. The owner made those changes in plans and went to the Appeals board, seeking special permits for setbacks smaller than standard zoning. The need for the permits had been driven partly by trying to keep expansions from intruding into the front yard, in order to satisfy Neighborhood Conservation. The Appeals board voted to approve the special permits, but now the owner must return to the Neighborhood Conservation District Commission. The plans approved by Planning and Appeals differ from those previously approved by the commission. With luck, that will be the last stop. Thanks to a cooperative owner, this project looks likely to reach a successful outcome. This entry was posted in Development, Environment, History, Housing, Meetings, Neighborhoods, Parking, Regulations on February 27, 2015 by Craig Bolon. A regular meeting of the Board of Selectmen on Tuesday, February 17, started at 7:35 pm in the sixth-floor meeting room at Town Hall. The agenda focused on the town administrator’s financial plan for the fiscal year starting next July. Hancock Village Chapter 40B project: In public comment, Judith Leichtner, a Precinct 16 town meeting member, questioned the board’s commitment to resisting a large, partly subsidized housing development proposed at Hancock Village in south Brookline by subsidiaries of Chestnut Hill Realty, the owner and manager. Ken Goldstein, the board’s chair, said that the board “will be discussing [litigation] next week in executive session…we have time…we are aware of the deadline.” Left unsaid: for a Board of Selectmen to sue the Board of Appeals that it appointed would appear to put the community in conflict with itself–a house divided. Contracts, personnel and finances: David Geanakakis, the chief procurement officer, received approval for a $0.38 million lease-purchase agreement with TD Bank. It will fund a set of DPW equipment anticipated in the current capital improvement plan. Stephen Cirillo, the finance director, got the board to certify expected operating life of at least 10 years for a new fire engine, a bonding issue. Licenses and permits:Hui Di Chen of Melrose, formerly involved with Sakura restaurant in Winchester and the proposed new manager of Genki Ya restaurant at 398 Harvard St., spoke for applications to transfer licenses held by the current manager. Mr. Chen seemed unprepared for some of the board’s questions. He had not sought out training provided by the Police Department on managing alcoholic beverage sales under the Brookline regulations. The board opted to hold the applications and reconsider them at a later date. Board records contain several misspellings of names. Haim Cohen of Brookline received a license for a restaurant he plans to open on the former site of Beauty Supply, at 326 Harvard St. To be called Pure Cold Press, it was described as a “juice and salad bar.” He has a major shortfall of parking under Brookline zoning and will also need approval from the Zoning Board of Appeals. Financial plan: Mel Kleckner, the town administrator, presented a financial plan for the fiscal year starting next July, assisted by Sean Cronin, the outgoing deputy town administrator, and by his replacement in the position, Melissa Goff. 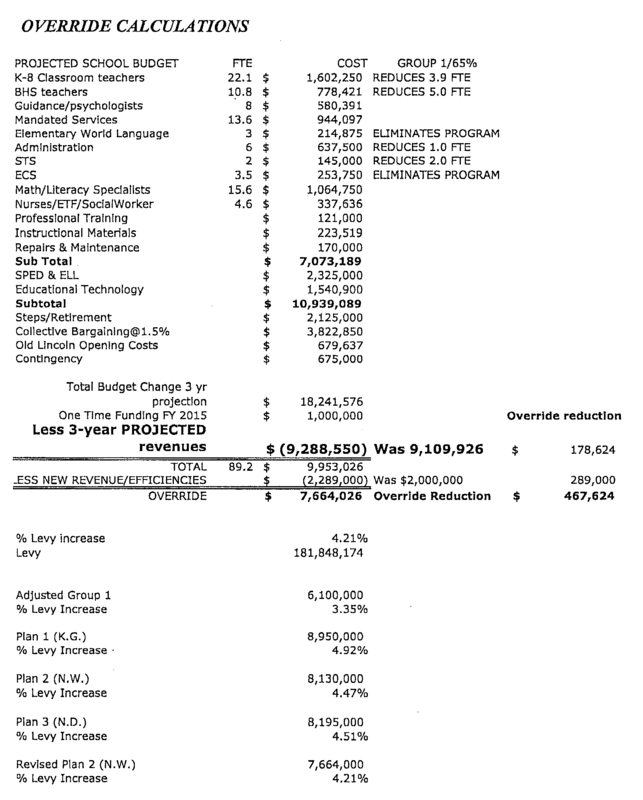 The main outlines do not include revenue from a tax override of $7.665 million per year that the board proposed on February 10. However, Mr. Kleckner’s plan shows how municipal agencies would use a share of those funds, if voters approve the override. Without funds from the proposed override, Mr. Kleckner had to propose substantial cutbacks in the municipal programs and agencies. Rental assistance from the Council on Aging would suffer a 25 percent cut, as would part-time Library assistants. Vacant positions in the Police Department and Fire Department would go unfilled. Park ranger, gardener and laborer positions in Public Works would be eliminated, reducing services. Several older vehicles would not be replaced. The Health Department would lose its day-care center inspectors and trim its contribution to Brookline Mental Health by 25 percent. If voters approve the proposed tax override next May, these cuts would be restored, costing an estimated $0.682 million per year from the proposed $7.665 million per year in override funding. Left unsaid: Public Schools of Brookline has a more difficult problem to solve. If voters reject the proposed override, there will be $6.983 million per year less in funding that could support school programs and departments. This entry was posted in Business, Development, Elections, Grade schools, High school, Housing, Licensing, Meetings, Neighborhoods, Public health, Regulations, Services, Taxes on February 21, 2015 by Craig Bolon. The Advisory Committee met Tuesday, February 10, starting at 7:30 pm in the first floor south meeting room at Town Hall–hearing requests for distributions from reserves. Contrary to usual procedures for warrant articles before town meetings, subcommittees had not been convened to investigate the requests. In at least one case, that might have helped. The committee considered three requests: one from Public Works to the Board of Selectmen for emergency snow funds, one from the Board of Assessors, for legal help to contest property tax appeals by utilities, and one from Human Resources, to fight employee complaints and lawsuits. The Advisory Committee has no statutory role in authorizing emergency snow funds and could hardly deny assistance for a tax appeal. Human Resources, legal services: With approval from the Board of Selectmen the preceding week, Sandra DeBow-Huang, the director of the Human Resources Office, asked for an additional $0.17 million in legal services to fight employee complaints and lawsuits. For the current fiscal year, her department has a budget of $0.20 million for contractual services. The request represents a large overrun: more than 80 percent. Ms. DeBow-Huang distributed to the committee a list of current employee actions involving legal services, with ranges of potential costs for each case. There were 15 active cases on this list, with pending costs during the current fiscal year estimated at $0.11 to $0.21 million for the active cases. Jenkins v. Brookline: The most expensive item on the list was a dispute starting in the fall of 2011, when a member of the Information Technology staff was dismissed after being unable to work a full-time schedule, following an auto accident. It is now Jenkins v. Brookline, pending in the federal district court for Massachusetts. In a public filing, Ms. Jenkins stated that she was pressured and harassed, that another I.T. staffer was fired around the same time for taking sick days and that Human Resources staff were made aware of those issues at the time. Ms. Jenkins, who is being represented through the B.U. Law Civil Litigation Program, has claimed civil rights and employee rights discrimination, in violation of the federal Family Medical Leave Act, Americans with Disabilities Act and Age Discrimination in Employment Act. She is seeking reinstatement with adjustment in seniority, compensation for lost income and benefits and for expenses, personal damages, legal costs and punitive damages. Potential costs to Brookline could be high. Since January, 2014, the Jenkins case has been in “discovery,” with documents exchanged and depositions taken. A status hearing is currently scheduled for 11 am on April 3. Judge George A. O’Toole, Jr., took over the case from Judge Joseph L. Tauro last May. Since Judge O’Toole is also handling the high-profile case of Dzhokhar Tsarnaev, accused of the 2013 Marathon bombings, the Jenkins case might be further delayed. Union actions: In a memorandum to the Board of Selectmen, Ms. DeBow-Huang accused the union that represents many municipal workers in general services of piling up costs, by filing complaints of unfair labor practices with the state Department of Labor Relations. However, her list of cases did not sustain the claim. There were only four such cases listed. with estimated maximum costs about a quarter of the total. Mr. Moroney is executive director of Council 93, for New England, of the American Federation of State, County and Municipal Employees (AFSCME)–with over 35,000 members. He began his municipal career in the Water Division of Brookline’s Department of Public Works. In 1971, he became the president of AFSCME Local 1358, representing many Brookline workers in general services. He left the Water Division seven years ago and joined the staff of Council 93 full-time, becoming executive director in 2012. Bruce Genest of the Planning Department is now president of AFSCME Local 1358. Despite accusations from Ms. DeBow-Huang, her list of legal actions includes more from Fire and Police, a smaller workforce, than from employees in general services. The list distributed at the Advisory Committee meeting might be incomplete. At least one recent termination dispute, one other union action and one widely reported potential civil rights lawsuit may not correspond with cases listed. Years ago, legal disputes between Brookline and its mostly unionized employees were fairly rare, but after Ms. DeBow-Huang became the Human Resources director they appear to have become more frequent. According to union leaders, she tends to state a “position” and does not seem willing to negotiate. The state Department of Labor Relations (formerly the Division of Labor Relations) can arbitrate if negotiations fail or grievances remain unresolved. This entry was posted in History, Meetings, People, Services on February 13, 2015 by Craig Bolon. A regular meeting of the Board of Selectmen on Tuesday, February 10, started at 6:35 pm in the sixth-floor meeting room at Town Hall. Toward the end of its meeting, the board proposed a $7.665 million tax override to cope with increasing school enrollment and a debt exclusion to renovate and expand Devotion School. Those two questions will appear on ballots for town elections this spring. Contracts, personnel and finances: Andrew Pappastergion, the town’s public works commissioner, described snow clearance for the extended storm that began on February 7. So far, he said, Brookline spent $0.28 million on it–the third major snow storm of the winter, with a total of 73 snow inches now recorded at the municipal service center for the season. Mr. Pappastergion sought and received approval for $0.15 million in emergency funding to replace a sidewalk snow tractor. Two of the four that Brookline owns are about 20 years old, have been out of service during the recent storm and need frequent repairs. There has been only limited snow clearance in commercial centers, with sidewalks treacherous and parking lanes filled with snow several feet deep. Many drivers in Coolidge Corner have parked in bicycle lanes; few citations appear to have been issued. Tax override: Shortly after 8 pm, the board began to debate proposals for a 2015 tax override. Ken Goldstein, the chair, proposed $7.993 million per year. Board member Neil Wishinsky proposed $7.665 million. Both amounts were much higher than $5 million per year recommended on July 30, 2014, by the Override Study Committee of 2013. However, all members of the board had publicly stated that they favored more money. No cogent descriptions emerged for the amounts proposed. At the previous meeting on February 3, an unsigned, undated memo had called out an override of $7.664 million, but that also provided no cogent description of what the particular amount might accomplish. Predicting three or more years of future budgets to four significant digits is comparable to predicting the recent 20-inch snowfall to 1/64 of an inch, risking doubt rather than confidence. Three board members–Nancy Daly, Betsy DeWitt and Ben Franco–said they supported Mr. Wishinsky’s proposal. At that, Mr. Goldstein withdrew his proposal and joined the others in voting to propose a $7.665 million per year general tax override. As long expected, the board also voted unanimously to propose a debt exclusion for the renovation and expansion of Devotion School. Mr. Goldstein said he expected that the proposed override would suffice for five years. The board has not yet explained what the proposed override would buy or what would happen if voters reject it. Members of the School Committee present at the meeting would not speculate on what the override might accomplish or estimate how long the override might suffice with rising school enrollment. This entry was posted in Elections, Grade schools, Meetings, Parking, Services, Taxes on February 12, 2015 by Craig Bolon. A regular meeting of the Board of Selectmen on Tuesday, February 3, started at 6:35 pm in the sixth-floor meeting room at Town Hall. The agenda was slim, considering that the previous week’s meeting had to be cancelled because of snow. Board member Ken Goldstein announced that he will not be running for another term this spring. He has served on the board since 2009 and has been chair since May of last year. Before that, he was a Planning Board member for 15 years, chairing that board from 2004 to 2009. He was previously a member of the Housing Advisory Board, and he served as a town meeting member from Precinct 14. He practices law at a Brookline firm, Goldstein & Herndon. Contracts, personnel and finances: Sean Cronin, the deputy town administrator, has submitted a letter of resignation. Later this month he begins a position with the state Department of Revenue as Senior Deputy Commissioner for Local Affairs. Mr. Cronin has worked in the Brookline office of the town administrator for 17 years. He described Brookline management as a “team effort” and said he hopes to engage with state policy initiatives in the same spirit. Mel Kleckner, the town administrator, got board approval to fill Mr. Cronin’s position and said he intends to promote Melissa Goff, the assistant town administrator for the past nine years. She came to Brookline from the Boston Office of Budget Management during the Menino administration. In Brookline, she has been in charge of annual budget preparation and has participated in the development of online services. Mr. Kleckner also has approval to fill Ms. Goff’s position and said he plans a broad-based search for candidates. Ray Masak, a building project administrator, got approval for a $0.12 million contract with Eagle Point Builders of Belmont to restore doors and windows of the historic gatehouse at the Fisher Hill Reservoir, the lowest of several bids by a small margin. References said Eagle Point Builders did good work for other towns on restoration projects but warned that Mark Moroso, the owner, could be “tough” to deal with. The architect is Touloukian & Touloukian of Boston. Peter Ditto, the engineering director, got approval for $0.02 million for a dam inspection at the Brookline Reservoir. He hopes to resolve issues with the growth of vines and bushes so that trees and landscaping can be maintained rather than cleared. The contractor, Tighe & Bond of Worcester, will prepare a tree management plan. Anthony Guigli, a building project administrator, got approval for $0.06 million in change orders for projects underway at Lawrence, Devotion and old Lincoln Schools. He reported that the Devotion project will not require indoor air sampling, because levels of soil contamination from oil tanks were below hazard thresholds, but there will be offsite soil disposal. Snow removal budget: Andrew Pappastergion, the town’s public works commissioner, described snow removal for the two storms that began on January 27 and February 1. He said the municipal service center received a total of 46 inches of snow, none of which has melted so far, and he estimated costs of snow plowing and removal at $0.53 million for the first storm and at $0.23 million to date for the second one. The town’s budget for snow was based on 43 inches over the season, in line with the historic average. That has been exhausted, with winter just half over. Mr. Pappastergion asked the board to authorize emergency snow funds under Chapter 44, Section 31D of the General Laws, and the board voted to do so. Those funds will later be made up by tapping the reserve fund, by cutting other budgets this year or by dipping into next year’s funds. There is no Proposition 2-1/2 exemption for emergency snow funds. Mr. Pappastergion was also authorized to fill four vacant positions and to accept $0.006 million in state grants to support recycling. He said a state grant of $0.2 million is pending, to purchase waste bins for a trash metering program that he expects to implement later this year. He has been operating under priorities of the former Patrick administration and did not seem to have planned for potential changes in priorities under the new Baker administration. Costs of job friction: As reported in the Beacon, Brookline has been experiencing increasing friction with employees. Sandra DeBow-Huang, the director of human resources, asked the Board of Selectmen to approve a $0.17 million reserve fund request, for legal services. She said unexpectedly high costs mainly came from two employee lawsuits and one employee complaint to the state Department of Labor Relations (DLR). The request for legal services funds is historically large–around eight percent of the total reserve fund, which is already facing stress to pay high costs of snow clearance. It is likely to be scrutinized when it reaches the Advisory Committee, which controls the reserve fund. Ms. DeBow-Huang complained of “tight time frames” to respond to DLR proceedings. DLR is a fairly new state agency assembled in 2007 from older agencies. Its investigators and its Commonwealth Employment Relations Board hear and rule on union issues when contracts do not include binding arbitration. The Board of Selectmen later interviewed a candidate for the Human Resources Board, without getting much insight on job friction from that interview. Marathons: Josh Nemzer, representing Boston Athletic Association (BAA), sought and received a parade permit from the board for the 2015 Boston Marathon segment on Beacon St. He described road closing as lasting from 9:15 am to 5:30 pm next April 20. Board member Nancy Daly objected to repeated refusals by BAA personnel last year to let Brookline pedestrians cross Beacon St. and said BAA might want to consider using Commonwealth Ave. instead, if it could not accommodate community needs. In another version of marathon, the board resumed its discussion of 2015 tax override proposals, once again without reaching a conclusion. School Committee chair Susan Ditkoff and member Rebecca Stone were present along with William Lupini, the superintendent of schools, Peter Rowe, the deputy superintendent for finance, and Jennifer Fischer-Mueller, the deputy superintendent for teaching. This entry was posted in Elections, Events, Grade schools, History, Information, Licensing, Meetings, Services, Sports, Taxes on February 4, 2015 by Craig Bolon. A regular meeting of the Transportation Board on Tuesday, January 20, started at 7:00 pm in the first-floor north meeting room at Town Hall, with all board members except Ali Tali present. The board reviewed plans for taxi stands and for parking on Pearl St. and River Rd, near the forthcoming Brookline Place redevelopment, and it affirmed town-wide restrictions on special parking permits. At this fairly well attended meeting were Todd Kirrane, the transportation administrator, chair Linda Hamlin and member Mark Zarrillo of the Planning Board, chair Cynthia Snow and member John Dempsey of the Bicycle Advisory Committee, John Bassett, Antonia Bellavista, Edith Brickman and Arlene Mattison, members of the Brookline Place design advisory team, Capt. Michael Gropman of the Police Department, and several residents and business owners near the Brookline Place area. Parking near Brookline Place: George Cole of Stantec Consulting presented parking proposals for the Brookline Place Redevelopment on behalf of Boston Children’s Hospital, the developer. He was assisted by Robert “Robbie” Burgess of Vanasse Hangen Brustlin of Watertown, transportation consultants, by Timothy “Tim” Talun of Elkus Manfredi Architects and by Brian Chou of Mikyoung Kim Design, landscape designers. The project developers have proposed a parking reconfiguration that moves a taxi stand near the bend of Pearl St., opposite the Brookline Village Green Line stop, across the street and adjacent to the stop, leaving the part of the street that will be adjacent to a lawn unobstructed. To compensate for loss of spaces, they propose so-called “reverse angle parking” along part of Pearl St.–an unusual approach, backing in to park. They cited a few examples, the closest on Bow St. near Union Sq. in Somerville. Some board members had not kept up with the development and were surprised at the proposal. Gustaaf Driessen asked, “We don’t get taxi space back as parking?” Yes, that’s right. However, Mr. Cole conceded, “The reaction to angle parking has not been wholly positive.” Mr. Burgess explained the “reverse angle parking” scheme, and board members asked whether Pearl St. would need to become one-way, like Bow St. in Somerville. The consensus seemed to be that Pearl St. should remain two-way. The discussion veered into bicycle facilities. Some in the audience, including Ann Lusk of Hart St., called for a “cycle track” through the area–meaning a pair of fully separated bicycle paths. No cost was cited, but those can run more than a million dollars per roadway mile. Mr. Burgess said Pearl St. was not wide enough. One board member doubted the contribution to a transportation network, since Pearl St. is a loop that does not form part of a thoroughfare. Capt. Gropman said the proposed plan for Pearl St. amounted to reducing on-street parking from 55 to 41 spaces and was likely to create problems. He asked about moving the taxi stand to Station St., on the other side of the MBTA stop. Mr. Kirrane objected that much of the demand for taxis would be coming from the new development. Ms. Hamlin said the Planning Board and its design advisory team favored the developer’s plan for the taxi stand, noting that the development’s new parking garage would offer short-term spaces to the public. There was extended discussion about locations of stops for the three MBTA bus routes–Nos. 60, 65 and 66–that pass through the intersection of Route 9-Washington St. with Pearl St. Passengers of buses westbound on Route 9 have good access to the area from the bus stop just west of Pearl St. next to 10 Brookline Place, formerly Hearthstone Plaza. Passengers going the other direction encounter problems, especially for the No. 66 bus continuing onto Huntington Ave. The other two buses travel on Brookline Ave. There were no resolutions to the issues; the board took no votes. River Road, bicycles and parking: Running about 40 minutes late, the board took up the topic of a bicycle path parallel to the Riverway Bridge across Route 9 at the Boston and Brookline border. Mr. Kirrane and Ms. Snow described the plan. It would connect paths in Riverway Park to the north, along the Muddy River, and in Olmsted Park to the south, toward Leverett Pond. Bicyclists must now cross at intersections with poor visibility and signage and with heavy traffic. Board chair Joshua Safer noted that the plan was “rejiggering our priorities,” apparently meaning in favor of parkway bicycle paths instead of street-oriented bicycle lanes. Mr. Kirrane described a target of opportunity, saying that Erin Gallentine, Brookline’s director of parks and open space, “got a $1 million grant from DCR (the state Department of Conservation and Recreation) that includes the project this year, to construct it this summer.” Left unsaid: with a change from the Patrick to the Baker administration, the grant might be withdrawn if it were not promptly applied. As submitted to DCR, the plan reconfigures some existing bicycle paths and some Riverway access ramps, adding colored bands marking bicycle crossings. A point of contention is that a bicycle path needs to be built along the southeast side of River Rd., where there is not enough space near the intersection with the Riverway access ramps. Mr. Kirrane said part of the River Road right-of-way was needed, removing up to ten parking spaces. Ms. Mattison of the Brookline Place design advisory team supported the plan, saying it was “reclaiming the area to the Emerald Necklace“–referring to a phrase from landscape architect Frederick Olmsted, Sr., for the 1,100-acre Boston park system bordering the Charles River and Muddy River. After extended discussion, the board voted to create a five-space no-parking zone on River Rd. to accommodate the proposed new bicycle path. Parking permit moratorium: Revisiting special parking permits for School Department employees and programs, the Transportation Board affirmed a moratorium. Long-simmering controversies over the impacts on neighborhoods reignited after a recent application for about 50 new permits to be used near Temples Ohabei Shalom and Emeth by pre-kindergarten teachers, administrators and support staff. The board voted to approve letters to be sent by the chair, Dr. Safer, to the chairs of the School Committee, Planning Board and Zoning Board of Appeals, advising them of Transportation Board policy. Permits now in effect will continue through the current school year. This entry was posted in Business, Development, Environment, Grade schools, History, Meetings, Neighborhoods, Parking, Regulations, Transportation on February 1, 2015 by Craig Bolon.